My first memory of wanting to be a pilot was me standing in the backyard and looking at an airplane flying overhead; I think I was about 6 years old. 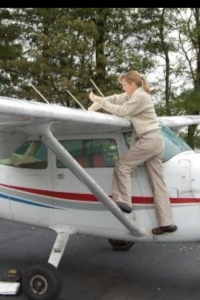 I had never flown in a plane before and had no idea what it would be like to be up there looking down, but I was sure that I wanted to be the pilot flying that airplane. I eventually told my dad my grand dreams, but my fire was quickly extinguished. Dad first mentioned something about pilots being men, then he told me you have to be in perfect health, next he said the only way to do it is to join the Air Force after you get a four year degree and just told me it’s not a realistic goal. How did I react? Shamefully, I just believed him and spent the next 14 years looking up and wishing it could happen for me. During my senior year of high school I went to speak with a USAF recruiter. I told him that I wanted to be a pilot, but even he made it seem like it would be a long shot, especially for a girl. Again, I turned to wishing and dreaming and staring at the planes flying overhead. I eventually met someone that told me I could learn to fly and encouraged me to do something for myself. I later met someone else who believed in me and wouldn’t let me give up. Fate has a way of sending people to you when you need them the most. They may not be actively in my life anymore, and that’s okay, but I am a much better person because of their presence in my life. I hope everyone has positive energy to send in the direction of their past, especially when that past is what launched their dreams. Never stop looking to the sky, take a moment to throw some gratitude into the universe, and keep the childlike enthusiasm that pointed you down your path in the first place. A friend has been asking to go flying with me for a while. Yesterday I noticed the weather would be perfect today for a trip to Greenville for lunch. Since this friend of mine is also from Greenville I thought this would be the perfect time to bring her along. We had a wonderful flight up and back. The flight from Mt Pleasant to Greenville was silky smooth, but the flight back was like a ride at an amusement park so my arms are going to be sore tomorrow. My parents were able to meet us for lunch, which made the trip even more special. 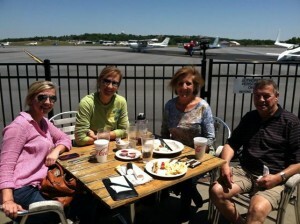 If you are a pilot in the Southeast US, I strongly recommend a stop at KGMU for lunch at the Runway Cafe. There is no ramp fee, the food is good, the view is great and you’re sure to meet some fun aviation loving folks. Building flight time is so much better when there is a purpose for the flight. Lunch is a good purpose. Coastal Aviation, the flight school that took me on at the very last minute to finish my IFR rating, asked me to do a write-up about my IFR checkride. Hopefully this will help someone else that is trying to get a feel for what to expect. When the checkride was scheduled, the DPE (Designated Pilot Examiner) asked me to plan a trip from my home airport, KLRO, to Lakeland Florida, KLAL, using “Victor Airways”. This was no problem because I had already planned a trip to LAL since I was actually flying down as Safety Pilot there just a few days later with a friend. The flight plan was to include proper altitude, frequency changeover points, expected approach and a weather briefing (among other things). When the examiner showed up we sat down to the computer to have me “sign in” to the FAA website to officially begin the exam. We then went into a room to begin the oral portion of the exam. He first asked me why I chose the route I chose. I chose it because of a NOTAM specific to the destination. The Victor airway route I chose required a specific altitude due to the high volume of air traffic enroute to the event (Sun-n-Fun). We discussed several symbols on the map along the way, weather briefings, equipment failure procedures and other emergency procedures. The DPE shared a few stories from his experience and asked what I may have done in the same situation. When he was satisfied that I was capable of good planning and decision making, we went to the airplane to begin the practical segment of the exam. For the practical exam there are several procedures the FAA requires the IFR applicant to demonstrate and 3 approaches that must be completed. Before we departed the DPE proposed that we do the unusual attitudes and steep turns before navigating to, and entering, the holding pattern for the RNAV (GPS) approach for Rwy 27 at KJZI. We departed on Rwy 35 on a Runway heading. When I reached approximately 700′ in altitude the DPE took the controls while I put my “foggles” on. We turned to the Southeast to head to the practice area. The DPE had me fly to 3,000′ over the ocean just off the coast of Isle of Palms and then he had me lean my head down while he flew the plane in attitudes meant to disorient me, and returning the controls to me with the plane pitched up and to the side at first, then again in a nose down attitude. Both times the recovery was smooth and satisfactory. After these I set up the GPS for the JZI RNAV approach for Rwy 27 and headed for the holding pattern entry. The direction we approached the IAF required a parallel entry, which we discussed as I was navigating to the IAF. 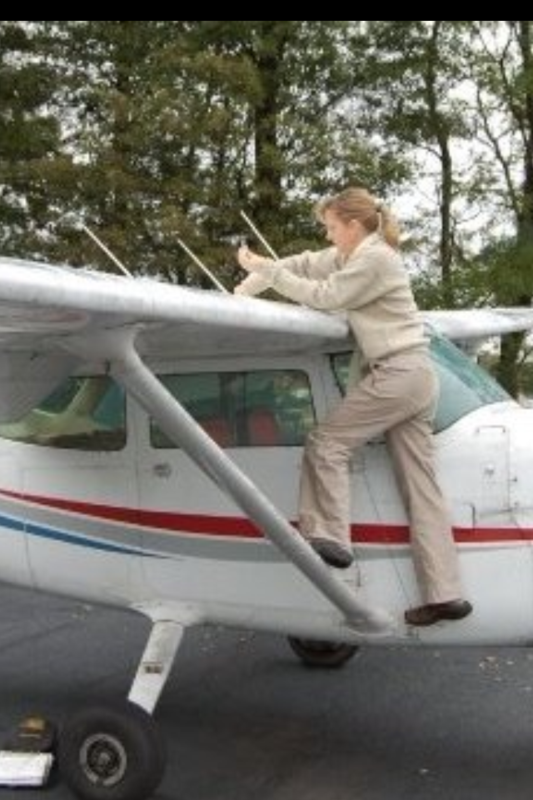 The FAA requires that one of the non-precision approaches be done with “partial panel”. As I entered the holding pattern for this approach the DPE covered the Attitude Indicator and the Heading Indicator. Lucky for me the air was silky smoothe and this was my best approach of the exam. When I reached the MDA (Minimum Descent Altitude) the DPE told me the airport was not in sight and I executed the published missed approach procedure, flying the entire MAP to include one full circuit in the MA hold at the RILEY intersection. After flying the MAP the DPE removed the covers from the instrument panel so I would have full instruments again. Next I programmed the GPS for the precision approach, the ILS for Rwy 9 at the same airport (KJZI). Upon reaching the DH of 270 the DPE took the controls so I could remove the foggles and do a touch and go. After doing the touch & go, we contacted Charleston Approach to request permission for our final approach procedure, the VOR/DME-A into KLRO. Charleston Approach gave us vectors to the CHS VOR, where we began our descent from 3,000′ to 1,600′ at the Final Approach Fix. After crossing the runway at the circling altitude of 540′ I began my turn onto the downwind leg. Unfortunately, the wind was a little stronger than what was reported, (AND I underestimated the distance I should have been from the runway) when we last listened to the AWOS, and I was blown past the runway. This was one of the few times in my flying career that a go-around was actually necessary, and it had to happen on my IFR checkride. At least I made the right decision and the checkride ended with the issuance of my IFR ticket, and not with catastophe.